If you have been following my blog for awhile, you would know that I have taken up ayurvedic traits in my diet. So, I was delighted when I was kindly sent a sample copy of The Ayurvedic Vegan Kitchen to review, and I have to say that I am impressed by what I have read so far. 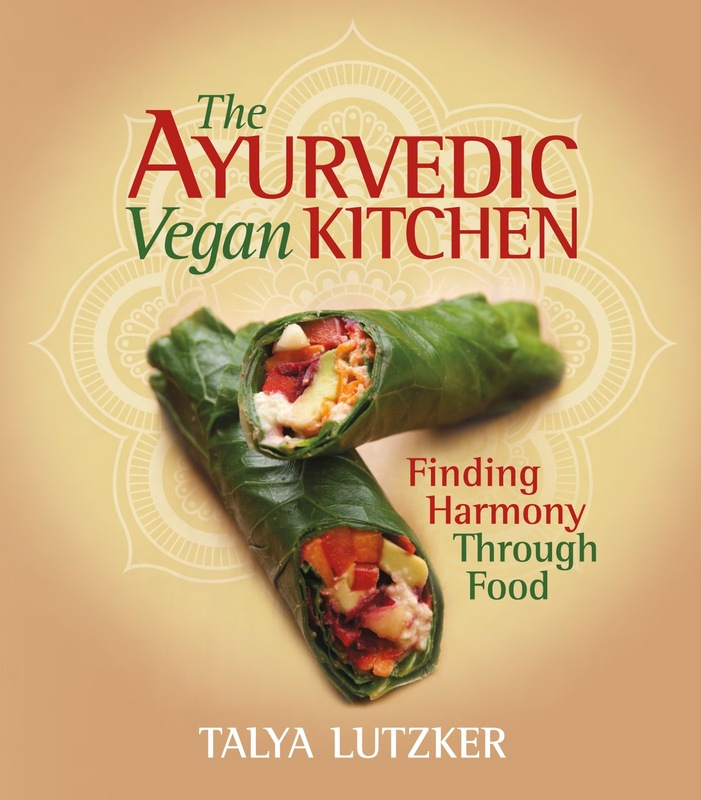 Talya Lutzker is a professional Ayurvedic practitioner and Nutrition counselor as well, so you know all the information in the book comes with good authority. She decided to create an ayurvedic book with a difference, that one difference being that all the recipes are vegan! (Just in case that didn't have the impact I desired, most ayurvedic diets are big on dairy, which hasn't made it very vegan-friendly). It's a little bit more than just a cookbook. The book opens with a brief introduction to ayurveda, including general dietary requirements. No cold drinks, no late meals... among others. 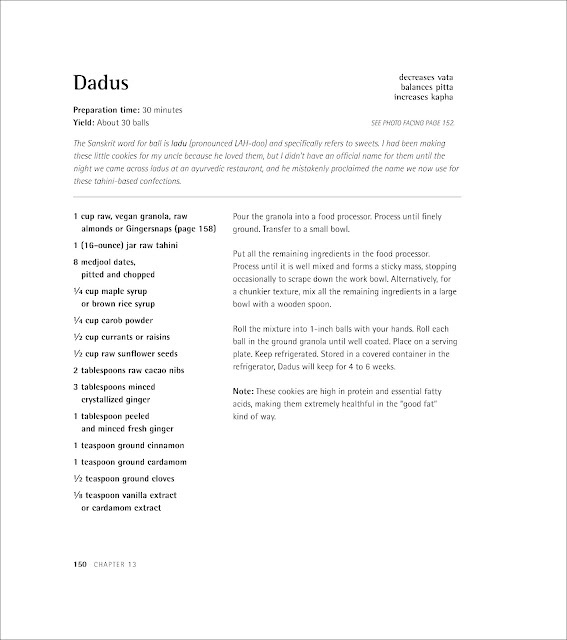 Then, comes a brief chapter on taste, or rasa (in Sanskrit), which I found really interesting. Who knew that taste could be so complex and even be connected to emotions! An example she gives is that eating sweet foods may make you happy... assuming you like sweet foods of course. But the biggest selling point would probably be the way the recipes are presented (see below). All the recipes have a dosha section that tell you if it increases, or helps to settle a dosha. It makes searching for recipes for your dosha that much easier, and it's also quite interesting to see what other dosha diets are like. If you would like to learn more about doshas, you can read my previous post about it. Perhaps the only downside to this recipe book is that the recipes are fairly complex and time-consuming. If like me, you live alone, work full-time, and have to basically eat the same meal over the next 2 days for lunch and dinner, then it may be something to try on the weekend. If you have the time though, there is nothing better than crafting a healthy meal for your family. 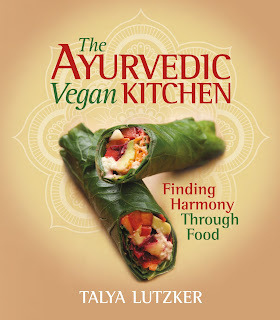 If you are vegan or lactose-intolerant and are wanting to try ayurveda, then this is definitely the book for you. I am very fond of my dairy though, so the recipes in this book will probably just be the occasional alternative. Cons: Recipes require a lot of ingredients (some that may not be easily accessible), most are time-consuming recipes, so not suitable for the busy! Thank you for the good review! It has so many delicious recipes. Hi Hui, thanks for highlighting this, definitely the dairy thing has meant I haven't really looked into ayurvedic food before so this vegan approach would suit me. I will check it out and see if I can get it in the UK. The Book Depository is my go-to site for books, and abebooks.com. I think the Book Depository ship free worldwide? It's definitely worth checking out, I've found the ayurvedic diet to be one of the easiest to follow, and it has really benefited my digestion.